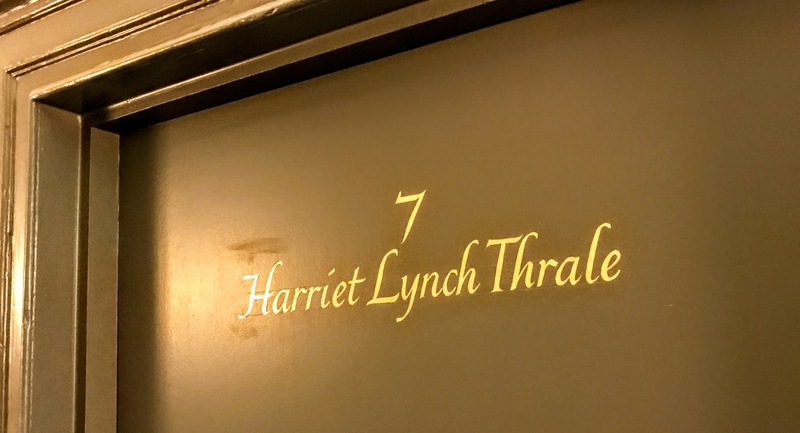 One of the rooms in the Hedgehog Vintage Inn, where I was staying this week during my two-day ‘mini-retreat’ in Lichfield, is named Harriet Lynch Thrale (No 7), after the diarist and friend of Samuel Johnson who was also his muse and his patron. Hester Lynch Thrale (1741-1821) was a diarist, author and patron of the arts, and her diaries and correspondence are important biographical source for the life of Samuel Johnson and for life in 18th century England. Hester Lynch Salusbury was born on 27 January 1741 at Bodvel Hall in Caernarvonshire, the only daughter of Hester Lynch Cotton and Sir John Salusbury, who belonged to an illustrious Welsh land-owning dynasty. After her father went bankrupt through ill-advised investments in Halifax, Canada, Hester married Henry Thrale, a wealthy brewer, in London, in 1763. They had 12 children, but while the marriage often was strained, Henry’s wealth she was able to enter London society, and met Samuel Johnson, James Boswell, Thomas Barnard (ca 1727-1806) who became Bishop of Killaloe (1780–1794), Bishop Thomas Percy of Dromore, Oliver Goldsmith, Sir Joshua Reynolds, Edmund Burke and other leading political, literary and cultural figures of the day. In July 1774, Samuel Johnson and Hester Thrale visited Wales, staying with Hester’s uncle, Sir Lynch Cotton, at Combermere in Denbighshire. Frances Cotton, who was married to Hester’s brother, Robert Cotton, found Johnson was both rude and delightful, and believed Hester wanted all his attention, to his annoyance. Johnson wrote two verses for Hester Thrale in 1775, the first in celebration of her 35th birthday, and another in Latin to honour her. Johnson often stayed with the Thrale household and had his own room above the library in their house at Streatham Park, where he worked. Hester visited Lichfield with Johnson in 1775, 1777 and 1779. Henry Thrale died on 4 April 1781, and Hester was forced to sell his brewery in Southwark and to wind up his business affairs. But she soon met and fell in love with Gabriel Mario Piozzi, an Italian music teacher, and they married on 25 July 1784. The newspapers of the day were flippant and disparaging, and described Piozzi as ‘an obscure and penniless Fiddler’ who had married ‘into sudden Wealth.’ The marriage also caused a rift between Hester and Samuel Johnson, which was only mended shortly before his death on 13 December 1784. 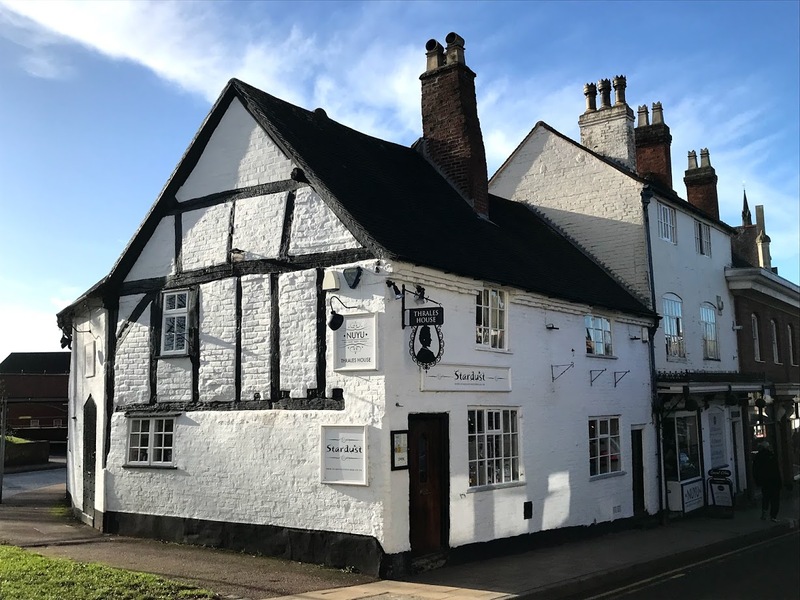 After his death, she returned to Lichfield in 1787 to collect his letters. Hester and Gabriel moved to Brynbella, a specially built country house on her estate in north Wales, where she became obsessed with the idea of reclaiming her father’s Canadian lands. After Samuel Johnson’s death, Hester published her Anecdotes of the Late Samuel Johnson (1786) and their correspondence (1788). These books and her diaries, which were not published until 1949, are sources help to fill out the picture of Johnson often presented in James Boswell’s Life. Hester Lynch Piozzi died in Bristol on 2 May 1821 and was buried on 16 May 1821 near Brynbella in the churchyard of Corpus Christi Church, Tremeirchion, next to Gabriel Piozzi. Samuel Beckett drew on her diaries and Anecdotes to dramatise her and Samuel Johnson's relationship in one of his earliest plays, Human Wishes. However, Beckett abandoned the play was abandoned after completing the first act. Although she never lived in Lichfield, Hester Lynch Thrale is remembered in Lichfield in the name of Thrale House, once the home of Thrale’s Restaurant in Tamworth Street, and, I suppose, in the ‘Harriet Lynch Thrale’ room in the Hedgehog. 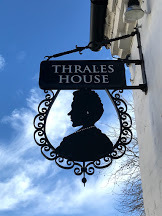 Thrale’s Restaurant closed in recent years, and is now the premises of Stardust and NUYU, but the house is still known as Thrale’s House, and a silhouette of Hester still hangs outside.